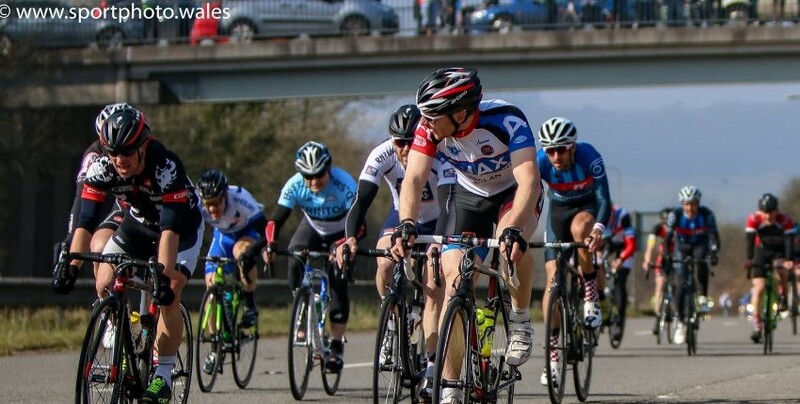 After a highly anticipated start to the 2016 Racing Season, our rider Jon Crouch decided to replace the smooth tarmac and sunshine after a recent Spanish retreat, for colder climes and the pot-holed roads of The Betty Pharoah Road Race in South Wales on Sunday. With a large field of 80 riders in the Cat 3/4 event, staying up the front would be as important as ever. After a disappointing season in 2015, Jon used everything he learnt not to do in road races and applied it to the race. This included staying up the front end of the race and staying on the outside of the group, rather than in the middle where you can quickly get swamped by passing riders. The race circuit was 88 km in length – 3 laps of the circuit with a 2km uphill finish. Total ascent was 1091m with an overall average speed of 37.4km/h. Windy, yet bright conditions greeted the riders on the day. The racing started fairly relaxed for the first lap, whilst everyone found their racing legs on the undulating course, with only 1 KOM/Prime sprint on each lap. However, the race was stopped for a short period at the beginning of Lap 2 due to dangerous riding by several riders crossing over the central reservation on the road, into head-on traffic. Having had a fatality at the race two years previous, the Cardiff Ajax organisers were rightly strict in disqualifying any riders caught doing so. Lap 2 saw the race come alive with a nasty 13% power climb, where several riders attacked. However, this was short lived. Jon said he was feeling strong and decided to try his own luck. Unfortunately, only going alone, paired with the high wind, meant the jump for a solo break was short lived. The race settled down again yet several riders still saw this as an incentive to try their luck to get to the front of the pack, crossing the white line on the road. The commissaires did a great job keeping this to a minimum. The final lap saw the pace ramp up to over 45kph average. The task was to stay as close to the front whilst conserving as much energy as possible. The final corner with 3km to go, Jon decided to get up the front in the first 10 riders, to help put him in contention. The final 2km uphill was a drag. Spinning through the gears, the final attack seemed to be eternal. Annoyingly Jon’s only mistake of the day was getting boxed in behind two riders. With an attack on the inside and with 200m to go, the overall winner was already 30m up the road before Jon could get out. Jon crossed the line in 16th place, within a group of 4, 5 seconds behind the overall winner. A great race and definitely one to do. Thank you Cardiff Ajax, for a great race. Bring on the 2016 season.